For dogs, there are lots of common external parasites including, fleas, ticks, mites, maggots, flies, etc. I'm pretty sure no dog parent wants their beloved pup to have any of these things on them. Today, I want to talk about a bug that might be new to you. The bug I'm speaking of is called a "kissing bug". They are also known as "cone nose bugs", "assassin bugs", and "Mexican bed bugs". These bugs pose a threat not only to dogs, but humans as well. They come out at night to feed on the blood of their victims - people and animals. They typically bite around the eyes or mouth on people, which is where they get sweet name. But trust me - these things are not sweet! Kissing bugs can sometimes carry a parasite called Trypanosoma cruzi. They pass the parasite on to dogs or people by biting them and then leaving their feces in the bite wound. Also, a dog could potentially eat one of the bugs causing them to catch the parasite. By now, you're probably wondering what exactly this T. cruzi parasite does. The parasite T. cruzi is responsible for Chagas Disease in both humans and animals. It lives in the bloodstream of its host - the white blood cells to be specific. After it ruptures out of the cells, it makes its way into organ tissues of its host. In dogs, T. cruzi is really fond of heart muscle tissue and brain tissue. In dogs, Chagas disease may present with symptoms that are very similar to typical heart disease. According to PetMD, Chagas Disease is endemic in South and Central America. Over the course of the past century, kissing bugs that are native to these areas have made their way up north and can now be found in the United States. 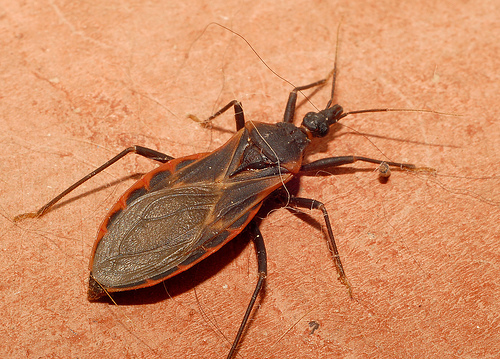 More cases of kissing bugs and Chagas disease are being seen in southern states. I remember helping treat a dog with Chagas at least once while I was working as a vet tech. 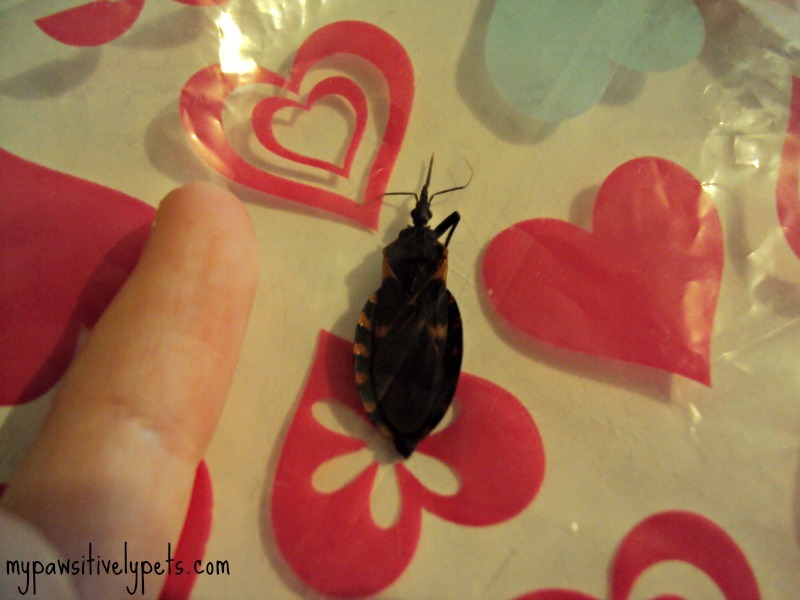 The inspiration for this post is pretty simple - I found a kissing bug in my bedroom the other day. You see, about a week or so ago I wrote an article on Examiner about the growing number of kissing bugs in Texas and Chagas Disease in dogs. I searched through pictures of kissing bugs on the web. One night, I saw a bug on the floor (it was dead) and I flipped it over. I instantly gasped because the markings were exactly the same as the pictures of the kissing bugs I had been looking at. If I hadn't written that article, I would have just thought it was some harmless bug. Now, I am 99.9% positive that this is a kissing bug. I put it in a plastic baggy. I am so not happy about this and I hope I don't find anymore. Yes, I put my kissing bug in a plastic bag covered with hearts... Anyways, that is my pinky finger next to it for size reference. This bug is missing some legs and things since it was dead when I found it. You'll notice the distinct pattern along the edges of the bug's body. I wish I could have gotten a better picture, but I just couldn't get my camera to go much closer without blurring the bug. Treatment of Chagas disease in dogs doesn't sound too promising. It seems like there are a few drugs out there that help with Chagas, but it's pretty hard to cure completely unless its discovered early. Many dogs will experience permanent heart damage from Chagas disease which will need to be supported with ongoing care and medications. Apparently, kissing bugs like to live in old wood piles or hay. Getting rid of these things around your property could help with minimizing the number of kissing bugs hanging around your house. Since the bugs like to feed at night, keeping your dog indoors to sleep could also reduce their risk of being bitten by a kissing bug. Not only do I worry about my dog's safety after finding one of these bugs, but I also worry about my family's safety. Apparently, humans can have Chagas disease for decades and never know it until they become very ill one day. Definitely something I don't want to have to deal with later on down the road. I initially thought that these bugs along with Chagas Disease were pretty uncommon, until I found one of them in my home. I wanted to share this with other dog parents out there so that they can be aware and know what to look for. Like I said before, I would have never known what a kissing bug looked like if I hadn't been browsing through pictures of them. And if you're wondering about the prevalence of Chagas Disease in cats, there just isn't much information about it at this point in time. There is so much more information about Chagas Disease out there. I've really only touched the surface of kissing bugs, T. cruzi, and Chagas disease with this post. The Center for Food Security and Public Health has a really informative publication on American Trypanosomiasis if you're interested in learning more about it. Have you ever heard of kissing bugs or Chagas Disease before? AKA Tom Cruise's Kissing Disease? I have never heard of this and thank you for bringing it to my attention. I doubt we'll get them here in cold, wet Cascadia but I'm always wanting info on what to beware of when we travel! I doubt they'd be up that way too. May still be good to know if you ever travel South! Woah. Never heard of this and so glad to know! Here and there I see bugs that I've never seen before and always wonder what they are, where they came from and what they do. Like Cascadian Nomads, I'm happy to know what's out there to help stay safe! There are also some other vectors for the disease, but I didn't really research those much. So I guess you could get other ways in different areas. One of the ways was a blood transfusion. Yikes! I think you are probably safe Mollie! Never heard of them! Thanks for writing about this and though I'm hoping I'm too far north to have to worry about them, at least now I know what to look for. We agree with Mollie....we hope we don't have them here. Have a tremendous Thursday. Yea, I think it's definitely a possibility. Mostly I have heard of them in AZ and TX for now. We are the same with Mollie and Molly! Gosh I never heard of this. Thanks for the information. OMD, that's a horrible sounding bug and disease! :-/ Why do entomologists always feel the need to give nasty things cute names? We've never seen one of them in Northern Cali, but I'm sure they're here...ick! Do you guys have hay or wood near your home? I hope it's the last that you see! We have a very large field and when it gets mowed, the stalks of grass kind of turn into hay on the ground I guess. That's what I was thinking anyways. :-/ Hm, well hopefully someone just brought it in from the outside...perhaps on a shoe! Those are some ugly bugs! Oh wow, that sounds terrible! We never knew about these bugs. Hope you've been well and sorry we haven't been by in a while! Our bookmarks are all a little scattered! Hi Katie and Coco - glad to see you again! good things they are so huge. its easyer to spot them. OMG, those are super creepy! Not to worry you but do they travel in packs? Yuk! Hmm I'm not really sure. Some of the reports that I've read people were reporting small numbers of them. The most I read about was one woman finding 6 total in her house through the span of a few months. That's an ugly bug. Did you try using the Mackerel setting on your camera to get a closer shot? Do they bite cats. Regular bedbugs don't bite animals cos they don't like hairy things. TW is so worried about regular bedbugs since there was an epidemic in NJ/NY last year. I did try the mackerel setting lol. I think it had to do with the background maybe. I think these will bite just about any mammal including cats. But there isn't much known about the transmission of their parasite to cats. I was worried about bed bugs before. Sometimes, I'd just be itchy and then I'd get paranoid. But I've never found any and haven't had that itchy problem in a few years now. They do kinda look like those. Looks like they are both in the same Order but that's as far as they go. We've got those Box Elder bugs here too. Weird thing is, they DO damage the Boxelder trees here. We had to cut 3 trees down at our other house because they damaged them so badly that they were hollow inside the trunk and limbs were breaking off as well. A pest company told us that was about all we could do once the bugs took over if we refused to have STRONG pesticides around our growing boys. They were right. Ten years after the consultation, we were dropping them. After all, the boys climbed those trees, and they'd become dangerous. It was either danger from the pesticides, or danger from breakage. At least with our way, they had 10 SAFE years left with them. Wow. TN is hotter than hades most summers, and I sure hope Kissing Bugs don't migrate here too. I don't know why I could expect that though. Everything else like fire-ants and Africanized bees has. Thank you so much for this warning, Ann! It's really scary, but we know what they can do, and what to watch for now. I wish I knew more about whether or not they've been found in TN. I'm worried about the beehive we have near our house becoming hybridized. Apparently the bees have randomly stung my father and his nursery employees and one stung my mom this year. UGH...I just found a map from the CDC: http://www.cdc.gov/parasites/chagas/gen_info/vectors/ It's even got info on all 11 species of triatomine bugs. *shudder* Yep. They're Heeeeeeeeere too! I'd never heard of them. I hope I never see one. I doubt you will have to worry about them Francesca. I don't really know what keeps them away, but they are so big I'm sure someone would notice if one was crawling on them!